A bird bath is a decorative way to attract birds to your lawn. 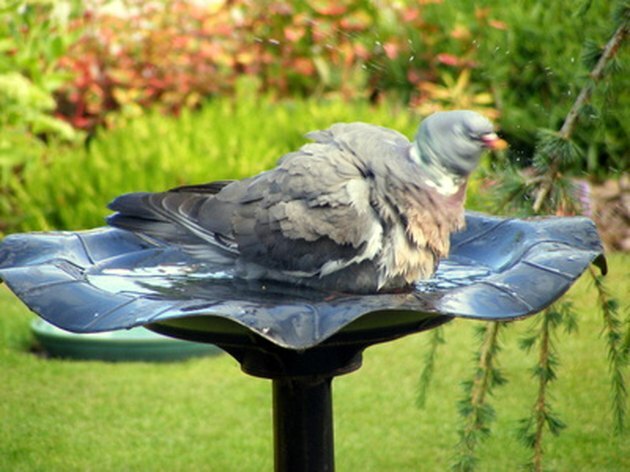 Bird baths provide a shallow basin for birds to find water for drinking and bathing. Humans should never drink from a bird bath, and bird baths should be cleaned weekly to prevent the spread of disease among birds. Bird baths should be kept clean to prevent transmission of diseases. Chlamydiosis is caused by a bacteria-like organism that is spread from bird-to-bird, bird-to-human, human-to-human or human-to-bird through contact with feces. In the United States, chlamydiosis is most prevalent in the poultry-growing industry. Infection may persist for years, as the bacterium is difficult to eradicate. Incubation typically lasts 10 days. In birds, symptoms include discharges in the nasal and eye passages, coughing and diarrhea. In humans, chlamydiosis contains the symptoms of an upper respiratory infection accompanied by fever. Salmonellosis is caused by salmonella bacteria, which are spread through contact with feces. Most animals are susceptible to infection by salmonellosis. Symptoms in all species include diarrhea, vomiting and low-grade fever. In persons and animals with compromised immune systems, or the very young and very old, salmonellosis may worsen to the point that the patient suffers dehydration, weakness, blood poisoning and death. The incubation period for salmonellosis is up to 72 hours. Colibacillosis is caused by E. coli bacteria, which is a bacteria normally found in the gastrointestinal tract of all animals. Birds that contract colibacillosis may experience blood poisoning, inflammation of the joints, inflammation of the heart sac, chronic respiratory disease and inflammation of the oviduct. Humans that contract colibacillosis will show symptoms of diarrhea. Severe cases may experience fever, dysentery and purple lesions on the skin and in the nasal passages. The incubation period may last up to 72 hours. Avian tuberculosis is a reportable disease to both health and livestock officials in states such as Florida. It is caused by the bacteria Mycobacterium avium, which is related to the bacterium that causes both human and bovine tuberculosis. Avian tuberculosis is caused by ingesting the bacteria, which is present in bird feces. In birds, the disease will cause debilitating injury and tubercular nodules. In humans, the disease will cause infection in localized wounds and will cause swelling of the lymph nodes. The infection is not treatable by antibiotics. Instead, the recommended method of treatment is to have the affected lymph nodes surgically removed. What Are the Dangers of Cleaning Up Rat Feces? What Germs Does Lysol Kill?